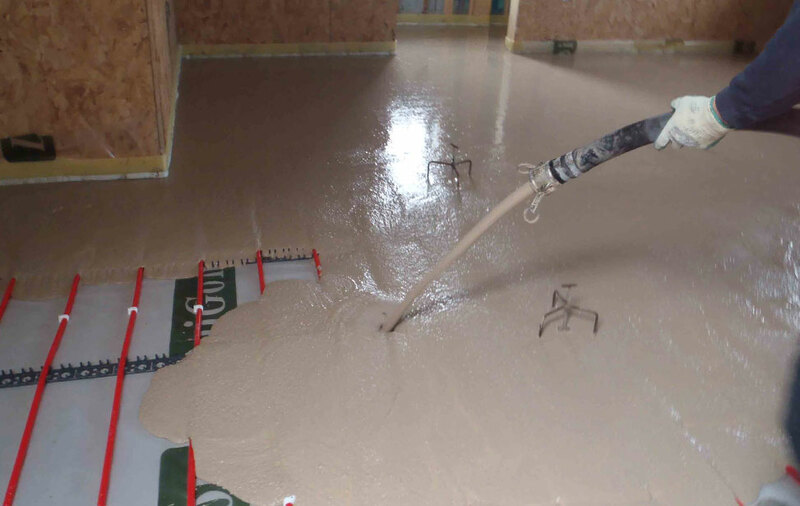 Liquid screed, flow screed and flowing screeds are all names used to describe the new generation of pumped liquid screeds now available in the UK. There are many benefits to using flowing screeds for floor screeding as they provide a high quality, cost effective alternative to traditional sand and cement screeds. Flowing screeds are quick to lay. Approximately 100m² can be laid in 25 – 35 minutes and as they have a high flexural strength can be laid much thinner. A 35mm floor screed will replace 75mm of sand and cement screed with an overall increase in strength. Flow screeds are sometimes referred to as under floor heating screeds or screeds for under floor heating and this is where they really come into their own. The increased strength means they can be laid at a much reduced thickness, typically 50mm. This, along with their increased thermal properties, means the floor heats up quickly – saving money for the customer on energy bills. Flowing screeds are laid using lasers and can easily achieve the standard SR2 under BS8204. When compared to cement based screed, a flowing screed floor application has no curling edges, minimal shrinkage and a finished surface suitable for most floor coverings. Our flowing floor screeds are protein free and we use environmentally friendly products. Gyvlon flow screed is manufactured under a controlled environment to BSEN 13813:2002.